‘Confident’ market brings increased occupancy and higher lease rates. While vacant commercial buildings still dot the landscape in Northwest Indiana, plenty of heavy machinery and steel beams are creating new homes for expanding businesses. Occupancy is up–in some instances way up from a few years ago. That means higher lease rates than commercial real estate brokers have seen in quite some time, as the economy continues on its lengthy course of recovery. It also means there’s not enough supply for the demand those real estate brokers are seeing from prospective business tenants. As quickly as new construction is complete or existing space becomes available, tenants are signing on and moving in. In a word, the commercial market is “confident,” says Shawn Todd, commercial broker with Newmark Grubb Cressy & Everett, Mishawaka. And it continues to build on the gains from 2015. While the market is confident, investors are not going to quickly forget the past. Still, there’s great potential for continued commercial growth in Northwest Indiana if–and that’s a big if–the region can deliver what prospect companies often want. And that’s available space on short notice. “There is a need in the industrial area of our market for spec buildings, especially as manufacturers grow and need immediately-available space for expansion,” Todd says. New construction is taking place where new construction can take place, but speculative project announcements aren’t coming as frequently as they do across the state line in Illinois. That puts Indiana at a disadvantage, as companies that otherwise would have expanded here are looking elsewhere. “The challenges we have experienced have been associated with the inventory of suitable light industrial and manufacturing locations,” says Michael Siwietz, broker associate with McColly Bennett Commercial, Valparaiso. Siwietz says the recent challenge of finding suitable buildings or development sites for Cook County manufacturing companies eying Northwest Indiana is their desire to locate as close to the border as possible for management purposes and work force travel. Locations south of the I-94 corridor, that would otherwise be ideal locations, do not have the proper zoning or permitted use for the needs of expanding businesses, he explains. Sites north of the Borman Expressway in Munster do, Siwietz says, but many of those buildings are older with limited ceiling heights or other issues that manufacturers don’t want to contend with in repurposing. McColly Bennett has introduced the Northwind Crossings business park in Hobart, although the development mostly contains build-to-suit with lease back. Northwind Crossings also has more stringent building standards and there have been challenges with outdoor storage of materials in some instances, Siwietz says. 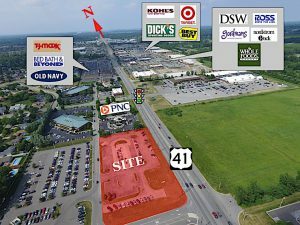 Holladay Property’s AmeriPlex at the Port, a 385-acre mixed-use business park in Portage, is another excellent opportunity for growing businesses, Siwietz says. The AmeriPlex campus contains industrial buildings, office buildings, restaurants and retailers. But the South Bend-based company’s master planned business park can be perceived as being located too far to the east of some manufacturers’ desired locations, Siwietz says. Two of the larger spec projects driving the commercial and industrial real estate market are happening in Valparaiso and Hammond, says David Lasser, president of Commercial In-Sites in Merrillville. Garmong Construction Services of Terre Haute is currently building an 80,000-square-foot shell building at The Lakes of Valparaiso, a $6 million, 150-acre planned, multi-purpose development east of Indiana 49 between Vale Park Road and Evans Ave. The company also has plans for a 75,000-square-foot spec building in Gary. Dan Zuerner, vice president of Garmong, says The Lakes of Valparaiso is being designed and constructed to accommodate a wide variety of business sectors, with a primary focus on attracting manufacturing companies. Services, the development will accommodate a wide variety of business sectors. “We anticipate employment within this facility to reach 80 to 120 employees once it has been occupied (for) three to five years, with an additional 30 to 40 different trades people participating in the construction,” Zuerner says. ATG Real Estate Development of Hammond has nearly completed framing a three-story, 37,000-square-foot Class A spec office building at 2929 Carlson Drive, where it will house its home office. The site, situated three miles east of the state line and within the revitalized Oxbow Landing, offers tenants prominent visibility on a stretch of I-80/94 used by about 170,000 vehicles per day. ATG has already announced similar-sized plans for a second phase, Lasser says. Merrillville-based container maker, Polycon Industries, is expanding its facility with another 150,000 square feet, and Nuco Steel Bar Technologies started construction last spring on a 150,000-square-foot mill that should be up and running during the second quarter of 2017. “The increasing demand for precast high quality construction buildings with loading docks and higher ceiling heights draws a wide range of potential tenants,” Lasser says. Medical users and health care facilities have been another driving force of new construction, says Siwietz of McColly Bennett Commercial. Assisted living and memory care facilities continue rapid growth in Northwest Indiana and across the country. The lack of readily available commercial space, either new or existing, has made it challenging for commercial brokers like Aaron McDermott, president of Latitude Commercial in Schererville, to meet the demands of so many prospects looking near the Illinois-Indiana border. REDEVELOPED Former Krispy Kreme site in Schererville is getting new life with the help of Latitude Commercial. There are often challenges associated with leasing existing buildings to new business tenants, depending on the site and tenant’s needs for the physical real estate. But McDermott says liquor license costs also pose a challenge when courting prospective businesses to Indiana. Commercial brokers are encouraged by the amount of speculative space now under construction because those buildings are creating opportunities that have not been in existence for some time in Northwest Indiana.